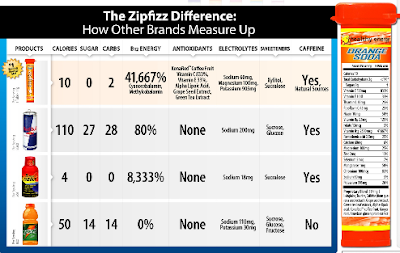 I had the incredible opportunity to review Zipfizz. This stuff is absolutely amazing. I actually think it is magical. 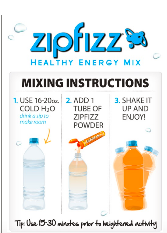 Zipfizz is an all-natural powder that transforms water into an energizing performance drink. Each serving gives you a powerful charge of 25 nutrients comprised of vitamins, minerals, key amino acids, electrolytes and antioxidants to fuel your body. This is the easy part. Zipfizz comes in these small little bottles that you pop the lid and pour into your water. You can either add it to water in a glass and stir or pour into a water bottle and shake. You choose. The directions say add it to 16 to 20 ounces of water, but if you like a super strong taste, go ahead and add it to less water. There is some fizz associated with it, so be careful with any small explosions that may happen if you choose to shake it in a water bottle. The provided water bottle top doesn't secure very tightly and always gives me a little pop if I don't put my finger over it. 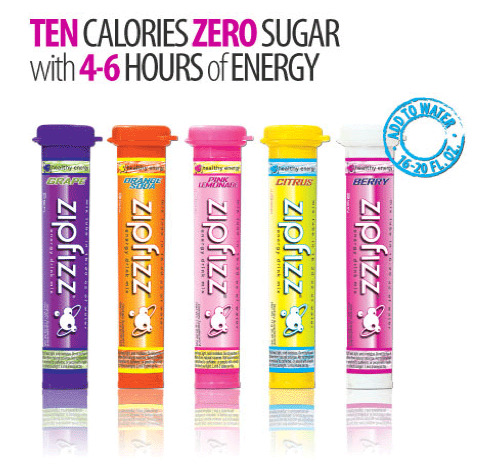 Zipfizz is a healthy energy mix, with only 10 calories and 2 carbs is jam packed with 41,677% Vitamin B12. And caffeine. 100 mg to be exact, of naturally occurring caffeine from Guarana and Green Tea Leaf extract. Zipfizz comes in Grape, Orange Soda, Pink Lemonade, Citris, and Berry. It also comes in a "limited time" - Orange Creme flavor. Of course (because it won't be around forever), Orange Creme was my favorite. To me, it tasted just like an orange creamsicle. Although, each of the flavors tasted great to me. Within 15 minutes of drinking my water bottle filled with Zipfizz, I felt energized. I actually had two amazing, training runs this past month with some of the miles coming in at 7:40’s. Just prior to running each of those times, I had downed a bottle of Zipp Fizz and there you go! The Zipfizz website says the increased energy will last for 4 to 6 hours without the sudden "crash". I definitely did not notice any type of crash. Or, if you are lucky enough to have one of these places local to you and for them to carry Zipfizz Unfortunately, Zipfizz hasn't made it to either of my Targets yet. Someday, I hope! Or I will have to bite the bullet and go to Walmart. Note: I did receive Zipfizz free in in exchange for a review. All opinions here are my own and I was not required to give a positive review. Looks good, it kind of reminds me of Nuun! If I ever see it in Rochester maybe I will try it out.